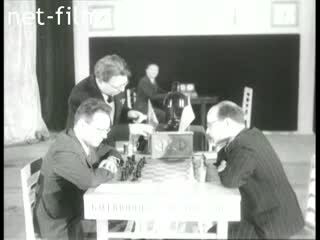 About two-month world championship match between chess grandmaster Mikhail Botvinnik and Bronstein D.
M.Botwinnik the chessboard with a second of Rogozin. Bronstein playing chess with a master of Constantinople. Tchaikovsky Hall during a meeting at the beginning of the match. M.Botwinnik and D.Bronstein the podium. Speakers: The President of the International Chess Federation, Mr.
Folke-Regard, the match referee Grandmaster Gideon Stahlberg, Chief Justice Opochensky. M.Botwinnik and D.Bronstein during the game. The audience at the demonstration boards. Grandmaster Kotov gives an explanation to the audience. In the lobby of Isaac Boleslavsky gives a simul. Among those present: Krishnamachari Indian chess grandmaster Flor, Master Simon Furman, Master Robert Wade, Hungarian GM Laszlo Szabo. M.Botwinnik on the commemoration of the end of the match. Speakers: Karel Opochensky, President Ari Ilmakunas, Mr.
Krishnamachari, Robert Wade, Wolfgang Nitg (GDR), Ludek Pachman (Czechoslovakia). Ilmakunas crowned wreath M. Botvinnik. On behalf of the All-Union Chess Section Kharlamov participants of the match awards commemorative cups. National Champion Women's Chess Championship Cyrus Zvorykina brings flowers and M.Botwinnik D.Bronstein.